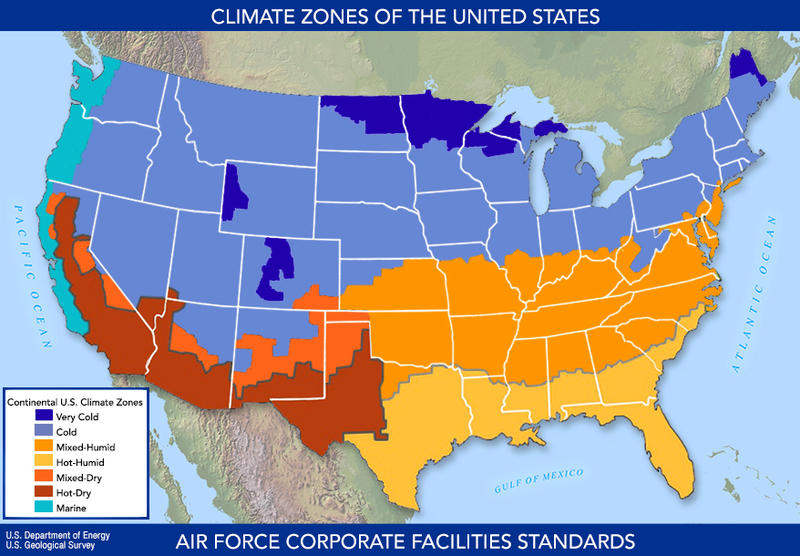 The Air Force Corporate Facilities Standards (AFCFS), is an enterprise-wide program of facility standards establishing an acceptable level of quality and performance for facility design, facility operations and ongoing building maintenance. AFCFS provides an exciting direction forward; intended to create sustainable installations and cohesive, efficient, High Performance and Sustainable Buildings throughout the Air Force. Our primary goal is optimizing mission success while reducing initial costs, life-cycle costs, energy use, and water use. Mission success is optimizing productivity and well-being of all Airmen and civilian personnel. AFCFS’ goal is to support mission success while balancing available resources with an appropriate level of quality. Balancing cost, functionality and character in facility design will help us meet the diverse and stringent demands of our missions. First is to define Air Force standardized acceptable facility quality standards with narrative and sample images. Third is to provide a hierarchy of acceptable material quality performance standards consistent with DoD and AF criteria (links), including acceptable ranges of facility visual quality, durability, and use of resources. AFCFS consists of five main sections in a web-based publication. A principal theme is the designation of facilities into Facility Groups for which an applicable level of quality is assigned. Standards are provided to define an acceptable range of quality for each group number. Meeting (without exceeding) quality standards ensure optimal application of resources and investments. Overall, buildings must balance minimal use of resources while maintaining longevity, flexibility, and visual appropriateness for their specific group – a philosophy which emphasizes resource efficiency. Consistent with this philosophy, AFCFS emphasizes the cost- and time-saving efficiencies of a holistic, comprehensive approach to design through which individual systems are fully integrated from inception through design. AFCFS is intended to define Air Force expectations for Installation Facilities Standards and professional A-E design decisions. AFCFS provides comprehensive facility planning and design tools and resources; but perhaps more significantly, it provides a vision that links resource efficiency to mission accomplishment. Installation Facilities Standards (IFS) are included as part of the AFCFS program to assist bases in implementing facilities standards at the local level. Bases are required to develop and maintain an IFS—which replaces the Architectural Compatibility Plan—as a component plan of the Installation Development Plan (IDP). All Air Force design and/or construction projects must utilize advanced modeling to generate design, construction, record, and space utilization drawings deliverables as prescribed in USACE Engineering Construction Bulletin (ECB) 2018-7: Refer to CAD BIM Technology Center (Contract Requirements) for additional resources. As we fully implement the AFCFS program—all of our new and renovated facilities will firmly represent the dignity, virtue and long-term sustainability of the United States Air Force. The process for waivers and exemptions to Unified Facilities Criteria (UFC) requirements is set forth in MIL-STD-3007, STANDARD PRACTICE FOR UNIFIED FACILITIES CRITERIA AND UNIFIED FACILITIES GUIDE SPECIFICATIONS. The Approval Authority for the Air Force is HAF/A4C. Requests are to be submitted as a Criteria Change Request (CCR) to the subject document on the WBDG. The appropriate AF technical proponent will review, coordinate and staff for recommended action.